Thank you, very useful thing! Just drop your cryproject file onto this file. Some settings inside for where to put the package. Sovled almost all my problems! My current project.Start from 2018. Shows up as a 404. The changes were merged into the original repository and the branch deleted. All my changes are in the main repository or master branch . The package build feature in 5.4 is actually based on the script on Github, but it has quite some adjustments to make it work nicely with some of the engine features. The biggest difference is that the package build function uses the Resource Compiler of the engine to compile the assets into pak files. To do this it uses an rc-job xml file that describes what to do with which filetype. This means that if your project relies on files that are not specified in the rc-job, it's possible that they are not included in the package. Besides that the package build function doesn't support encrypted paks at the moment. For a guy who has never used Python before, can you describe the process? Need to install something first? 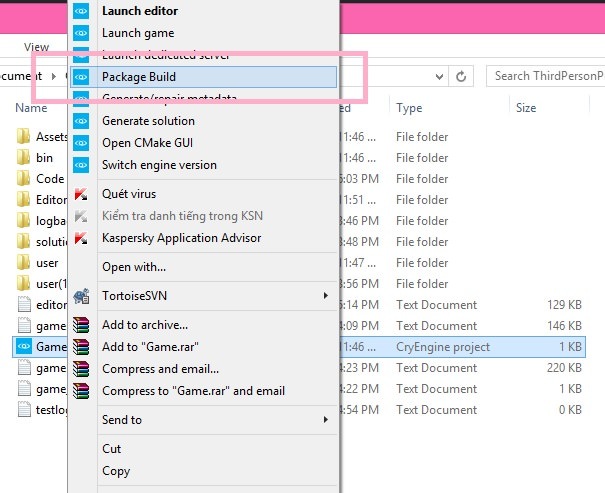 It is recommended to use the package build option for 5.4. If you insist on using this script take note that it has a few issues at this time. You will need to install python 3+. Once python is installed you should be able to run any file directly that has a '.py' extension. The current iteration of Patsy's package script should work by simply dragging and dropping your '.cryproject' file onto the the 'release_ce_project.py' file. This will create a folder on your desktop with the name of the project. (From the '.cryproject' file). 1. Copy your original '.cryproject' file to the new folder on your desktop. YMMV - This was originally designed for 5.3 and updated during the preview releases of 5.4. It has not been updated for the current 5.4 official release as the package build option does essentially the same thing, but in a more 'proper' manner. Again - It is not recommended to use this script for 5.4 and may even cause a few issues for larger projects on previous engine versions. It is more of a quick export method to speed up a quick development package deployment workflow. It is however, quite handy, for those previous versions of CRYENGINE.